I was contemplating doing a blog about slug racing one early morning on my way into work. While mulling the topic around my mind buds, I glanced up and noticed a White-tail buck walking across the road. His head was down and he was “on the trail” just like a bloodhound on the trail of an escaping jailbird. 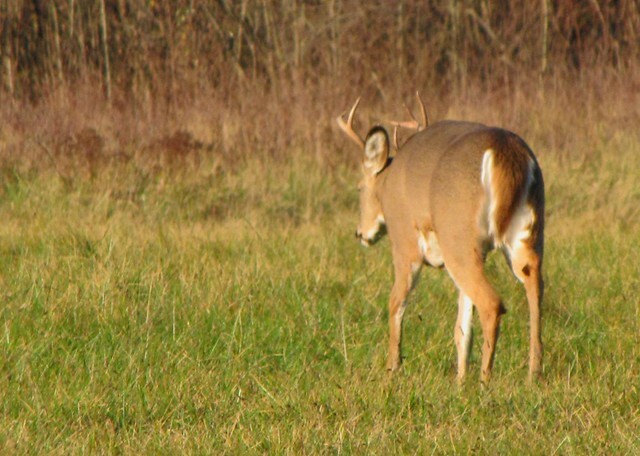 There is nothing quite like a buck in rut – you can tell one from a mile away just by the way they hold their heads while smelling the sweet scent of doe. I stopped to get a better view of the beast and all slug thoughts went out of my mind (and, since I am not a hunter, thoughts of leaden slugs did not replace these thoughts). Although many years in a park setting have taught me that deer are basically long-legged rats, I will always stop to look at antlered rats. When a second antlered rat… er, I mean a buck… entered the scene that morning, I sensed a bit of electricity in the air and the potential for a real honest to goodness smack down fight. Two years ago, I was lucky enough to photograph two middle-sized bucks going at it (look up “White-tailed Rumble” and see if it’s still on U-Tube). For a moment, I thought my second chance had arrived – on a sunny photogenic morning at that. The buck that initially caught my eye wasn’t all that impressive. It had a decent 8 point rack and the kind of looks that would have earned it the “nicest guy on campus” notation in the yearbook. In other words, it wasn’t one of those mutant body-building hunk type deer, but a decent fellow with good grades. As I mentioned, he was stalking across an open field towards a thicket edge. His head descended to the ground for a few occasional sniffs while maintaining a steady forward momentum at a consistent trot speed. He completely ignored my presence, even after I shouted out the window to get him to stop and turn around for a head shot (remember, I was armed only with a camera, so don’t let my lingo confuse you). When he suddenly stopped in his tracks and directed an intense stare at the north end of the thicket row, I was ready for some action. If a doe appeared, then I might be witness to the fawn manufacturing process. When another buck sauntered out, I was both relieved and ready (there is no way I was going to film deer mating). The second buck was quite large. His neck was swollen with hormonal pumping and long sessions of bush-whacking. This animal slowed his pace upon spotting the first, but dropped his head almost immediately to “feed.” The first buck continued to stare, but soon resumed his forward movement. He also dropped his head as if feeding. Although their gazes were averted, the two potential rivals were obviously sizing each other up. Animals often involve themselves in a behavior known as displacement when faced with a stressful situation. They may start to groom or tear at the grass as a way to alleviate their internal conflict. We humans do the same thing. When confronted with something uncomfortable we twirl our pencils about in our fingers, or re-direct our gaze at some fascinating spot up on the ceiling. There was an immediate problem, however, at least on my part. It was plain to see that the second deer had very small antlers. Technically they were four-pointed (six points if you count the two nubbins at the brow) but actually more like sporks -by that I mean those flattened fork/spoons. 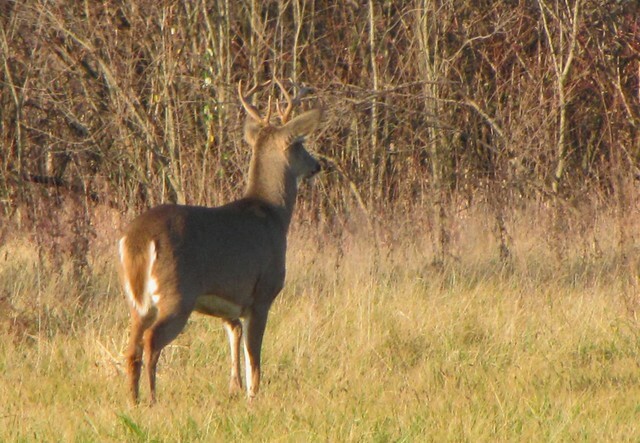 Antlers are a status symbol among bucks. 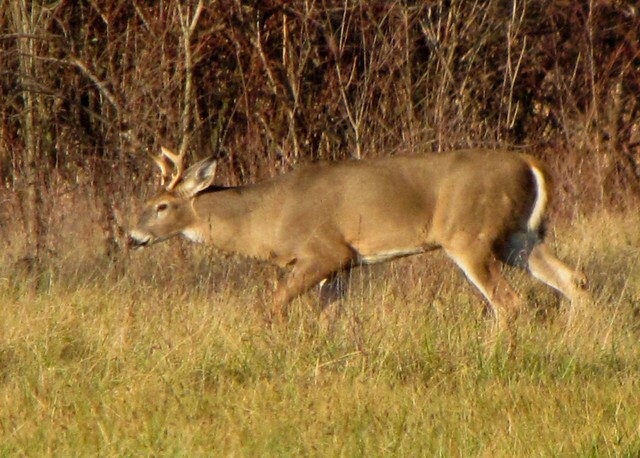 Fights do not usually occur between bucks of different antler size. The one with the bigger set automatically wins the field and that is that. My chances at seeing a rumble were rapidly vanishing. There was still a flash of hope as the two kinda-sorta circled each other. The one with the larger antlers was not all that impressive, while the small antlered fellow was quite beefy. I wondered if body size had anything to do with the “fight or flight” decision between contesting bucks. The large body/small antler deer (the one I am calling the second one) appeared very dark in the morning sunlight. This was due to the fact that he had raised his back and rump hairs on end – possibly out of aggression or fear. The small bodied/large antlered deer (yes, this is a bit confusing) did not puff up. After a very brief encounter (which you can see here in this video) the large antlered buck passively entered into the woods at the point where the smaller antlered beast exited. The second buck lowered his hair, raised his tail to drop some raisins, and with open panting mouth, continued on his doe trail (see below). In the end, there was no fight and I was only slightly disappointed. As is the case 99.9% of the time there are no contests between unequal males and it was good to witness one of these encounters. In this scenario it almost appeared that the second deer won the “non–fight” and I’m guessing it was on body size over antler dimension. Maybe there is some mental formula combining point count with body mass divided by will and multiplied by the desire to stay un-hurt. Heck, if I am confronted with a muscle-bound gym master with a small head I would also yield the floor. Come to think of it, a lot of muscle bound types have small heads don’t they? At least I had good grades in high school. I have had time to catch up on some of your past blogs—this one is very interesting…and, yes the youtube “rumble” video is still up! Awesome Gerry! !